For the past few days our place has been in the chaos with only have the Christmas decorating done (and bins everywhere). The trees are done and the twinkle lights are up, but there is still a Christmas village to finish, wreaths to hang up in the windows and an outdoor planter that needs some love. I’m looking forward to finishing it all this weekend when Garrett is home to help with the heavy lifting. 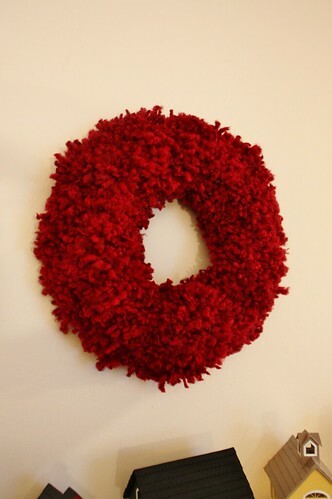 A large tufted wool wreath. 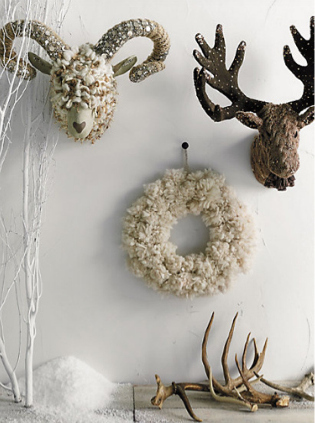 I was inspired by this Anthropologie Tufted Wool Wreath I saw last year for $128. As lovely as it was, I couldn’t justify the cost and I’m glad I didn’t, because I was able to make mine for about $15. I went with a warm red/burgundy colour to fit in with the rest of holiday decor and we already have way too much beige going on with our walls. To make the wreath, you need a foam wreath form (I grabbed mine at Michael’s with a 40% off coupon), and 2-3 skeins of a thick fluffy yarn, depending on the size of your form. 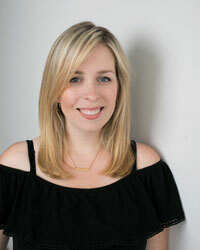 I made mine with a 12″ form which needed almost 2 skeins of this thick wool. 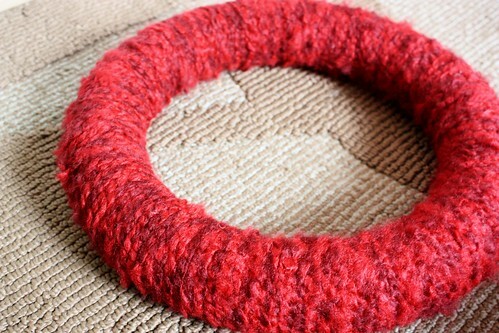 I started by wrapping the foam wreath form in some of the yarn. 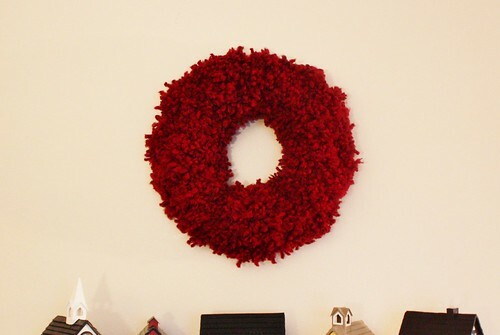 This will help to hide any holes when you’re adding the pom poms on and if you ever decide to hang it up in a window, it will look nice from the back as well. 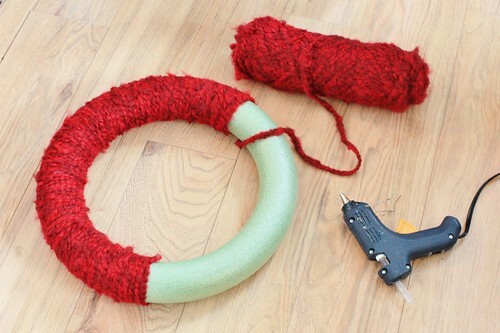 I used a hot glue gun and just put a dab of glue after every few times I wrapped the yarn around the wreath. This will keep in from shifting in place over time as well. I honestly could have left the wreath as it is with the yarn wrapped around it because I loved the warm and cozy look it had – but I really wanted to create that plush tuft look, so I went onto make the pom poms. 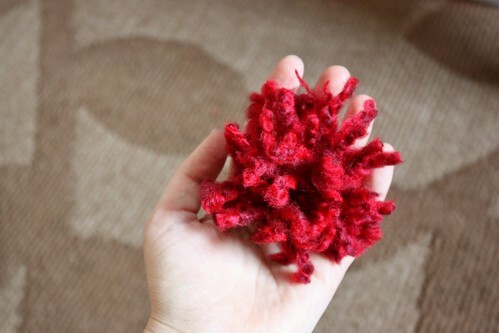 To make each pom pom, I started by cutting a piece of yarn 4-5 inches long that went between my middle an ring finger on my right hand. 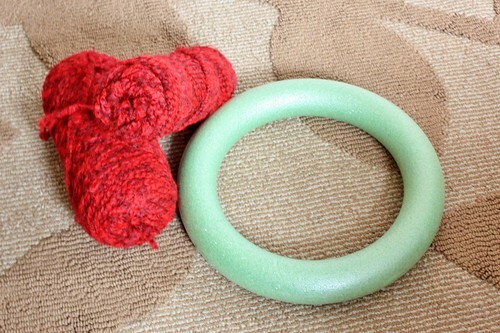 This is the piece you’ll use to tie off the pom pom. 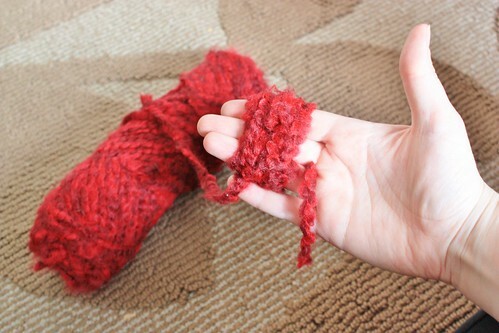 Taking the ball of yarn, start to wrap the yarn around your three middle fingers. 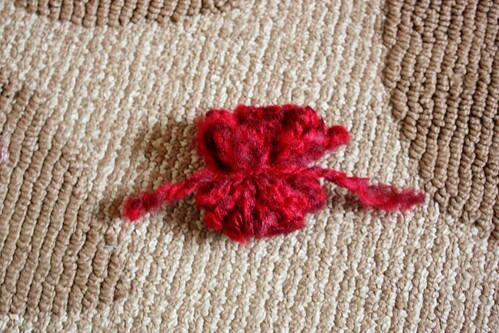 I did about 20 times around to make a nice medium size pom pom. 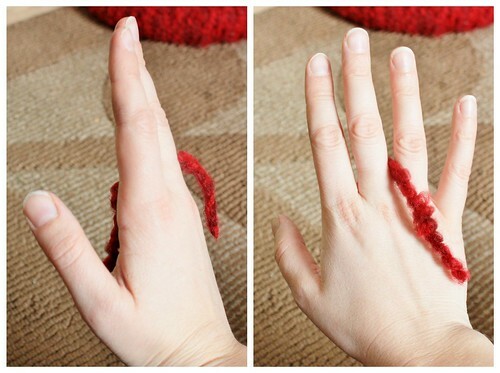 Then take the ends of the piece of yarn you stuck between your fingers and use that to tie all the loops together. You’ll have a bunch of loops on the top and the bottom, with the yarn you tied in the middle. 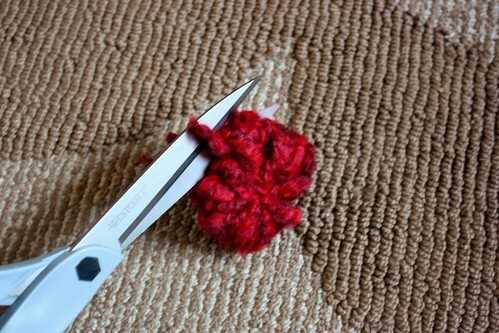 Take sharp scissors and cut all the loops in the pom pom, being careful not to cut the yarn piece holding it all together. Now you have a pom pom! 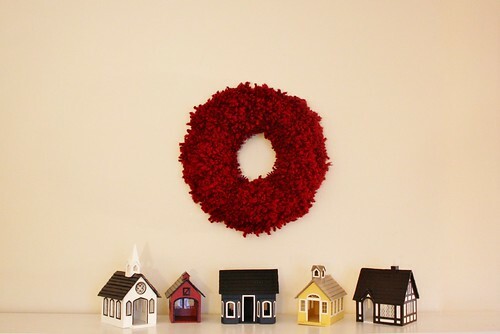 Continue to make pom poms until you have enough to cover your wreath. 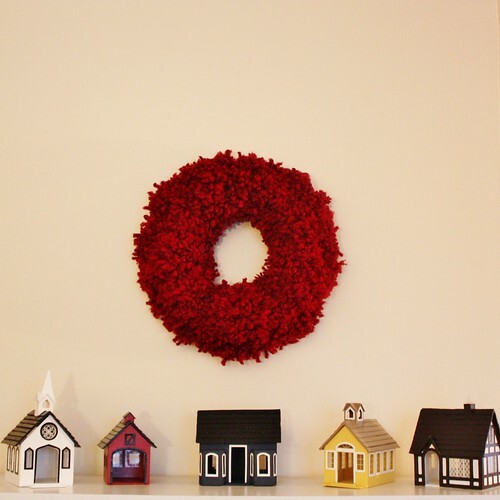 For my 12″ wreath, I needed about 50-60 pom poms. Whiskey loved this part of the craft – he kept trying to steal them to play with. I guess they looked like a fun toy. 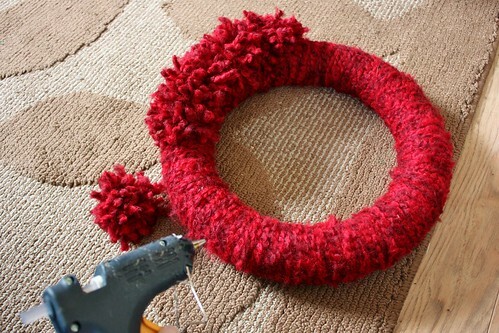 When you’ve made all your pom poms start to hot glue them onto the yarn wrapped wreath form. I tried to keep them close together to really make it look fluffy. I started with the ones for the middle part and went all around the wreath. Then I did another row all along the outside of that middle row, followed by the final row on the inside of the wreath. 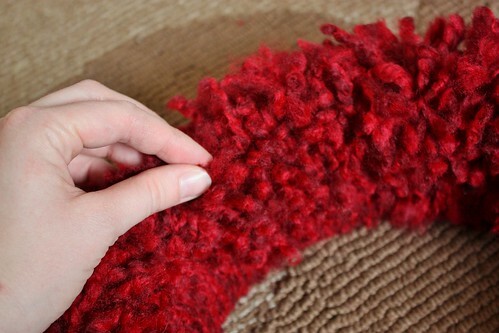 Once all the pom poms are glued in place, fluff them up with your fingers. 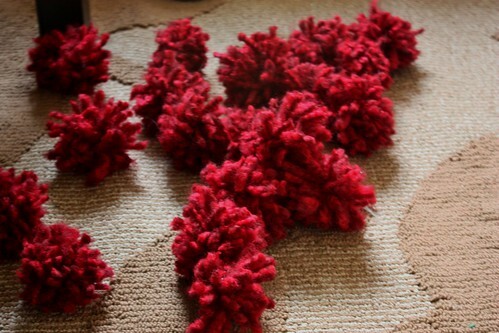 This will make them look like one giant fluffy piece, rather than individual pom poms. I’m still tempted to maybe had a big cream silk bow to it, but for now I’m going to leave it just lush and plush. I love this!! I’m definitely going to make one thanks so much on the “how to”.